The state of Oregon is currently phasing in mandatory ATV safety education for all riders by the year 2014. Each year since 2009, a new age group has been required to carry the Oregon ATV Safety Education Card according to the schedule below. 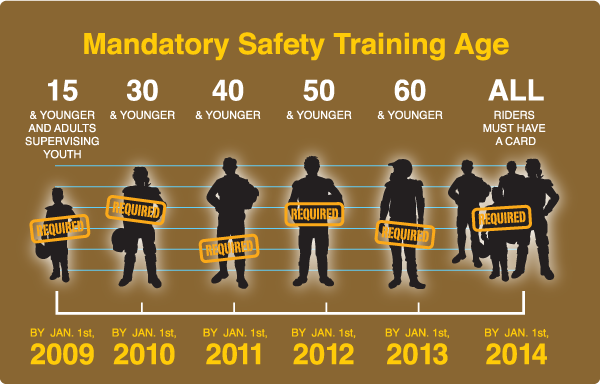 As of January 1, 2012, online training is required for all operators under the age of 50. By January 1, 2014, ALL operators must complete online training to obtain an ATV safety education card. Additional hands-on training is required for youth 15 and under. For more information on hands-on training, go to www.oregonohv.org/OPRD/ATV/. There is no minimum age for operating a Class I ATV. Dirt bike operators must be at least seven years old. Youth 15 years of age and under must be supervised by an adult who can provide immediate assistance and direction. Supervising adults are required to carry an ATV Safety Education Card. All non-residents operating an ATV in Oregon are required take the online ATV safety education course and carry the ATV Safety Education Card. If the operator possesses another state or country's ATV Safety Education Card, they are exempt from this requirement. Non-residents riding in Oregon if they possess an ATV Safety Education Card or equivalent issued by their resident state or nation. Persons operating a Class I or Class III ATV in a sanctioned competitive even. The laws and regulations on this page are meant as a quick reference for ATV riders. It is your responsibility to know ALL ATV laws before heading out on the trails. For a complete list of ATV laws and regulations in Oregon, please consult with the Oregon Parks and Recreation Department at www.oregon.gov/OPRD/ATV/.